The perfect hanging decoration for Easter! Decorate for Easter with our colorful Easter egg whirls. Each whirl hangs approx. 18” - 34” and is perfect to add to your Easter decorations. The spirals are vibrant metallic Blue, Cerise, Green, Orange, Purple, and Yellow. 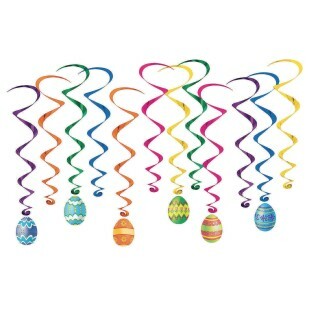 6 pieces come with festive cardstock Easter eggs, printed on both sides for a beautiful look as they swirl. 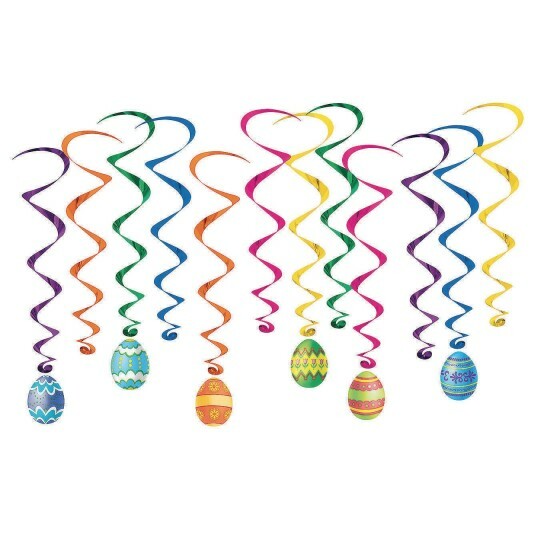 Hang from ceilings, doorways, entrances, and more for create a festive fun Easter celebration.